Home / David-Harewood / Melissa-Benoist / News / Supergirl-CW / television / David Harewood Says Martian Manhunter is Black Because He "Understands Injustice"
David Harewood Says Martian Manhunter is Black Because He "Understands Injustice"
"Supergirl's" David Harewood says Martian Manhunter chooses to be Black he because he understands injustice. 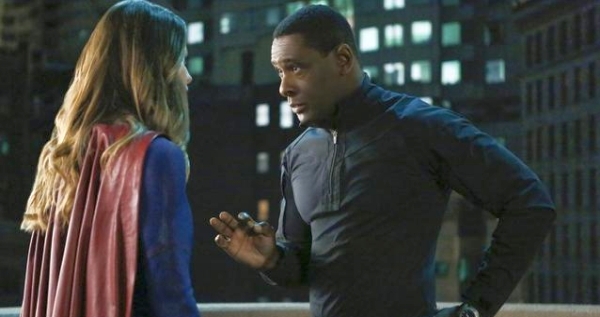 During the "The Many Shades of Heroism: DC Heroes Through the African American Lens" panel this weekend at DC in D.C. 2018, Supergirl actor David Harewood talked about the importance of black heroes. Harewood, a black actor who plays the shape-shifting alien Martian Manhunter said there's a powerful reason that he chooses to be a black man. The character of Martian Manhunter, named J'onn J'onzz, first appeared in the story "The Manhunter from Mars" in Detective Comics #225 (1955). The Martian's native skin color is green, but in his first appearance, he appears as a white man. On the Cartoon Network series Justice League he's voiced by veteran black actor Carl Lumby. On Smallville Manhunter was played by African-American actor Phil Morris. In the 1960s comics, Martian Manhunter takes on the form of a black man. Watch how David Harewood explains the importance of the character to a black Englishman (starting at the 43 min mark). He starts by pointing out that, as a black British man he looked up to black American heroes like Martin Luthor King. “Here is a character that chooses to be black," Harewood said. "He's a shapeshifter, he could be anybody, but he chooses to be black. And I think he chooses to be black, particularly in this day and age, because he understands injustice, he knows what injustice is about and as one of the most powerful people on the planet chooses to stand with those who are fighting injustice." "That's what's been wonderful for me to embody this person that could be anybody but chooses this skin and is proud to be wearing this skin," he said. It's awesome to see that, while technically Martian Manhunter isn't African-American (because duh he's from space) the actor recognizes the place that diversity has on television. What do you think of the Martian Manhunter being black?